Stay tuned for upcoming events for Laurent Decol in near future. Laurent DECOL is a world famous mime artist of the French origin. 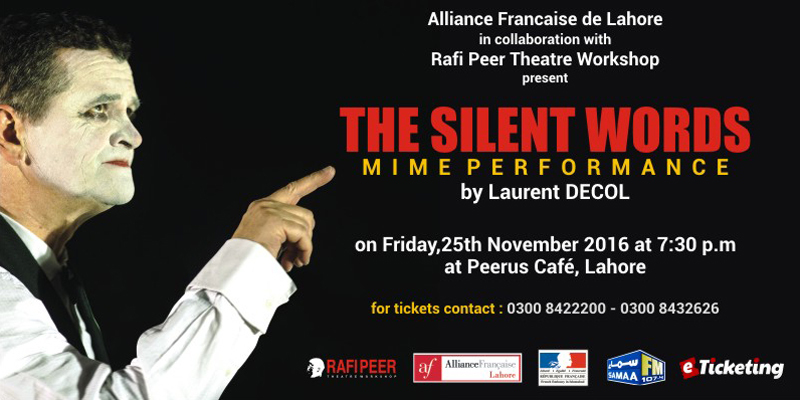 The Silent Words, a Mime Performance by Laurent Decol will take place on 25 Nov 2016 at the Peeru's Café in Lahore. This performance will be staged on the second of the three day workshop. Timing for Mime Laurent Decol event is 7:00 PM to 10:00 PM. Best Viewed at 1024 x 768 pixels and above. This Page loaded in 0.06504 seconds on Tue, Apr 23, 2019 (20:55).